The spectacular scuba diving spots located throughout the Puerto Vallarta region has attracted scuba diving devotees from all over the planet. 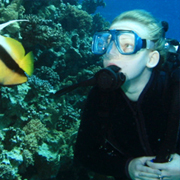 What makes scuba diving in Banderas Bay and the nearby Pacific Ocean so appealing to experienced divers? The sheltered coves in the temperate confines of Bahia de Banderas (Banderas Bay) offer superior clarity. Sheltered from high winds and rough seas that can disturb the sea floor and muddy the water, Banderas Bay is a diver’s paradise. But what really distinguishes diving near Puerto Vallarta from other scuba diving destinations are the incredible geological formations. Ancient volcanic activity created a wonderland of undersea sights, including underwater pinnacles, caverns, arches, tunnels, and swim-throughs. Dramatic drop-offs, walls, and underwater plains offer advanced divers some unique underwater geography to explore. There are granite islands that descend far beneath the water’s surface. 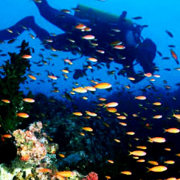 The marvelous coral reef environments of the Puerto Vallarta area are home to a teeming assortment of bio-diversity. In addition to a kaleidoscope coral and sponges, you can view hundreds of colorful tropical fish species. Other interesting creatures that dwell in the region include Olive Ridley Sea Turtles, Giant Pacific Manta Rays, Black-tips, Morays, Octopus, and a variety of mollusks and crustaceans. 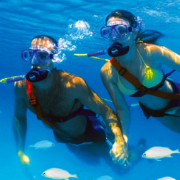 We supply the latest high-tech scuba diving gear for all participants on our dive trips. All of our equipment is scrupulously maintained by our highly-skilled staff. Our specially-customized dive crafts are outfitted with all the required amenities to supply our divers with the finest possible scuba excursions. 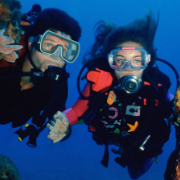 On every scuba expedition, you will be guided by a PADI-qualified English-speaking dive master. Departs From: Puerto Vallarta Witness the extraordinary splendor of this federally-protected marine reserve after sundown. In the evening, there is a whole different array of exotic species that roam the reefs that surround Los Arcos. Explore the teeming reefs and mysterious rocky formations of Los Arcos on a night dive adventure. Head out with our professional dive-masters to the Marietas Islands, a group of rocky isles near the border where the calm waters of Banderas Bay meet the Pacific Ocean. 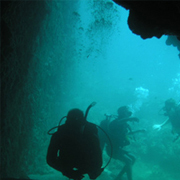 The unique dive location draws scuba diving enthusiasts from all over the globe. 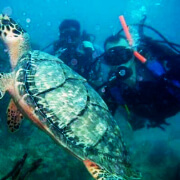 Journey with Chico's on an exhilarating scuba diving excursion to Los Arcos, a cluster of rocky islands in Banderas Bay. Above and below the surface of the water you will discover plenty of exotic plants and animals. This dive site is one of the most interesting locations near Puerto Vallarta. Las Caletas is a sprawling estate constructed on the shores of a secluded cove that contains a splendid coral reef that extends out to Banderas Bay. The protected waters of this cove remain calm and clear, resulting in excellent visibility for scuba divers to view the teeming aquatic habitat.